2011 January - Lucretia Regina-Potter Republican District Leader 46AD - Finally a Voice for the 46th Assembly District! But there’s a more positive note for Republicans, as far as public opinion goes, in a Gallup poll conducted Jan. 14-16 which found that, for the first time since 2005, more Americans had a favorable view of the GOP than an unfavorable one. Forty-seven percent of those surveyed now see the Republicans favorably compared to 43 percent who do not. 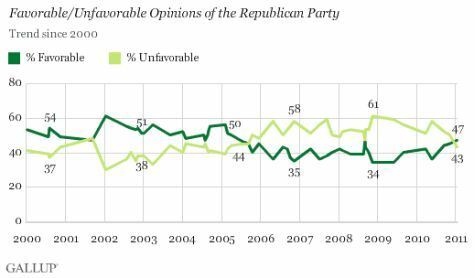 That compares to late 2008 when 61 percent saw the party unfavorably compared to 34 percent who had a positive view. Republicans had been in positive figures for most of the early 2000s before the public view of the Bush administration turned negative starting in 2005 when the Iraq war was going badly and President Bush took a hit for his administration’s handling of the aftermath of Hurricane Katrina. The downhill slide continued, enabling the Democrats to win big victories in the 2006 and 2008 elections. The public is split when it comes to its view of the Democrats. Forty-seven percent see them unfavorably compared to 46 percent who have a positive view. The Democrats had a favorable rating in the mid-to-high 50s between 2004 and late 2009, but last year, that changed when 54 percent saw the party unfavorably and 41 percent saw it favorably — numbers that were reflected in the results of the midterm elections. Gallup thinks the fact that the two parties’ ratings are generally similar will be an impetus to them to work better together, something other polls have said is what the public wants. As abortion opponents prepare for their annual March for Life on the Mall in Washington on Monday, pro-life activists are revitalized by the prospect of a Republican-dominated House they view as friendlier to their agenda than at any time since the Jan. 22, 1973 Supreme Court decision that legalized abortion. For example, new House leader John Boehner has said he wants to be “the most pro-life speaker ever” and New Jersey Republican Chris Smith, co-chair of the Congressional Pro-life Caucus, called this “the arguably most pro-life House ever,” a judgment with which many abortion opponents concur. And abortion foes can already point to a phalanx of bills introduced this past week by Smith and others, with more expected. The bills include one by Smith to permanently bar taxpayer dollars from funding abortion in any federal appropriation, a measure to enact stronger conscience clause provisions for health care workers, and a proposal to deny federal funding to Planned Parenthood. There are also signs that the federal judiciary is more receptive than ever to supporting laws that restrict abortion, and various states are enacting measures — mandating ultrasounds for women seeking abortions, for example — that hold out hope for decreasing the abortion rate, which is inching up after a three-decade decline. Yet as enthusiastic as pro-lifers are — and hope springs eternal at the start of every new Congress — they also face sobering political realities: While the House has a comfortable Republican majority, Democrats still hold the Senate, and President Obama — with his veto power — is in the White House and enjoying a bump in his approval ratings. So what can pro-lifers really expect in the next two years, and how nervous should pro-choice activists be? The short answer is that the coming battles on Capitol Hill will largely be about shaping perceptions ahead of the 2012 vote — in a word, politics. McCluskey also argued that bringing a range of anti-abortion bills to the House floor in the coming months would do two things: It would demonstrate to members that these arguments are not going away and that tedious annual disputes over taxpayer funding, for example, could be eliminated by codifying the ban in the Smith bill. And, two, the debates would get members used to voting for these types of bills in anticipation of further Republican gains in 2012. “Then as we go forward and look at hopefully a more conservative Senate and a more conservative person in the White House, the House knows their role because hopefully they’ve been doing it for a couple of years,” he said. Douglas Johnson, legislative director of the National Right to Life Committee, agreed that a significant part of the coming congressional session will be about establishing distinctions in voters’ minds ahead of November 2012. But, Johnson added, “I wouldn’t accept the premise that we won’t necessarily be able to make any affirmative progress” legislatively. He noted that pro-lifers were able to pass a number of agenda items when Bill Clinton was president, such as a ban on abortions at U.S. military facilities and a ban on human embryo research, both of which Clinton signed off on despite his opposition because they were part of other legislation that he supported. A bill to defund Planned Parenthood, introduced by Indiana Republican Mike Pence, who is increasingly mentioned as a GOP presidential hopeful for 2012, is the kind of thing that could be inserted into a larger appropriations bill, for instance. If it reached Obama’s desk that would then create a political dilemma for the president, who relies heavily on pro-choice voters for support. Moreover, promoting anti-abortion policies as budget-cutting measures is smart politics at a time when the public is looking to reduce deficits and cut spending. That’s how New Jersey Gov. Chris Christie, another rising Republican star, presented it when he slashed $7.5 million in state funding for Planned Parenthood in the Garden State. “His popularity was hurt more by a snowstorm than by the Planned Parenthood cut,” said McCluskey. 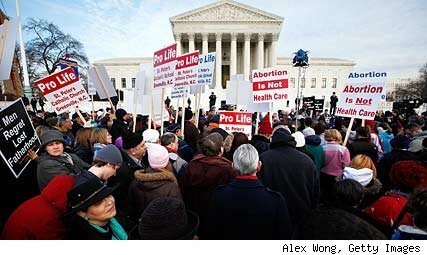 Still, the push to cut spending could also expose some rifts within the pro-life camp. The Catholic bishops, for example, are leading players in the fight against abortion but they do not want health care reform repealed, as many conservative pro-life lobbies do. Rather, they want to plug what they say are funding streams in the reform law for abortion providers (an argument disputed by health care experts) and would push to make government-backed health coverage “universal” and available to all. The bishops also support a range of social safety net policies. “[W]e will encourage one and all to seek common ground, reducing the number of abortions by providing compassionate and morally sound care for pregnant women and their unborn children,” New York Archbishop Timothy Dolan, president of the United States Conference of Catholic Bishops, wrote in a January 14 letter to each member of Congress outlining the hierarchy’s priorities. But that’s not the approach leading pro-life groups have traditionally taken. Another note of caution was sounded by Russell Shaw, a conservative Catholic writer and former spokesman for the U.S. bishops, who delivered a sobering perspective as he reflected on the battles over abortion rights that have consumed so much political energy since Roe, and with little real movement. To Shaw, the relative stalemate “merely underlines the magnitude of the task of education and persuasion facing the pro-life community,” a task that is not likely to be accomplished in this Congress or even if the 2012 election goes the way conservatives would like. But pro-life activists say they are encouraged, and have reason to be beyond their prospects in the House. Surveys show opposition to legal abortion remains strong and may even be growing, and they can point to any number of advances at the state level — advances that worry the pro-choice community as much as they hearten pro-lifers. NARAL Pro-Choice America estimated that the number of anti-abortion governors rose from 21 to 29 after the November election, and the number of states with governments where the governor and the majority legislature are both considered anti-abortion increased from 10 to 15. “Our state affiliates are definitely expecting to be in for the fight of their lives,” Donna Crane, policy director for NARAL, told Politico last month. Pro-life activists hope to see more states pass laws like the one adopted by Oklahoma last year requiring patients to undergo an ultrasound and listen to a detailed description of the fetus before getting an abortion. And Nebraska last year passed a ban on abortions after 20 weeks based on the concept that the fetus can feel pain at that stage. All of that ferment could well trickle up to the congressional level, or at least pro-life activists hope so. Reince Priebus, the head of Wisconsin Republicans but little known outside of internal GOP circles, was elected Friday as the new chairman of the Republican National Committee, succeeding the controversial Michael Steele who dropped out of the race as his support faded. Worried about debt and divided over their future political leadership, Republican National Committee members labored through seven ballots in the election to pick a chairman who can lead the party into the critical 2012 election cycle. Steele, conceding after the fourth ballot, threw his support to Maria Cino, a former Bush administration official. But it was Priebus who surged, reaching 97 votes on the last round of voting — 12 above the majority he needed from the 168 committee members eligible to cast ballots. Steele had presided over electoral victories, including the GOP takeover of the U.S. House in the midterms, but he has also alarmed some Republicans with his management style, a series of verbal gaffes and an RNC debt said by the Washington Post to stand at $20 million. In addition to Priebus and Cino, the chairmanship was sought by former Michigan Republican Chairman Saul Anuzis, who finished second on the last ballot, and Ann Wagner, the former ambassador to Luxembourg. Cino had the backing of House Speaker John Boehner, while Priebus was supported by former Mississippi Gov. Haley Barbour. Steele once counted Priebus as an ally on the RNC, the party’s organizing and fund-raising arm. The 38-year-old lawyer resigned as the national party’s general counsel early last month and then jumped into the race against his old boss. During his campaign, Priebus promised “less drama, more hard work” — which sounded like a reference to Steele’s stormy tenure. On Friday, he said he would move quickly to “restructure” the RNC’s financial operation. 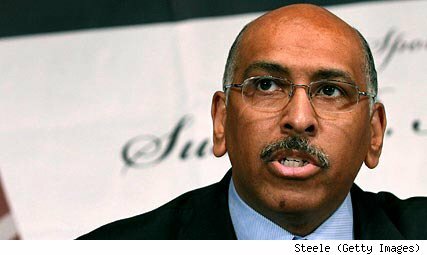 Steele, who served as Maryland’s lieutenant governor for four years ending in 2007, didn’t go quietly. “I’m a fighter and I am a little bit obstinate, but I am because I believed in the fight,” he told the committee members. He had earlier said he would stay in the contest until the final ballot was counted at the meeting in a conference center in suburban Prince Georges County, just south of Washington. The Post reported Friday that the RNC under Steele has seen a big drop-off in contributions from major donors — more than 600 people who gave $10,000 or more during the last two election cycles chose not to write checks during the midterm campaign. The RNC chairman is more than a front man for the national party. He or she also serves as a fundraiser, troubleshooter and candidate recruiter — critical roles heading into a campaign that will nominate a presidential candidate, seek to defend a new majority in the U.S. House and try to capture control of the Senate.